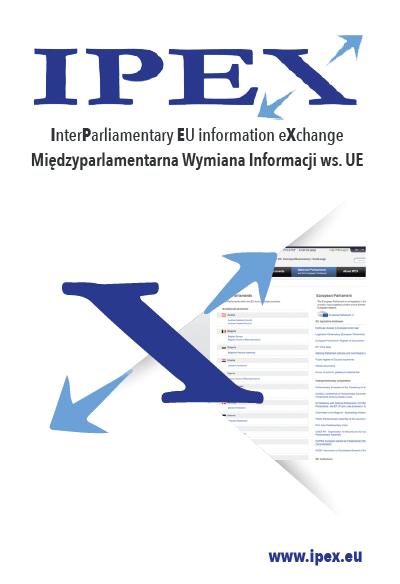 IPEX – Interparliamentary EU Information Exchange was established on recommendation of the Conference of Speakers of the European Union Parliaments in 2000. “The Guidelines for Inter-parliamentary Cooperation in the European Union”, which were adopted in The Hague in 2004, stated that the objective of IPEX is to support interparliamentary cooperation in the European Union by providing a platform for electronic exchange of EU-related information between parliaments in the Union. The website was officially put into operation in June 2006, and since 2007 the database has been available over the Internet. The core of the IPEX website is its database, which is automatically fed, starting on 1 January 2006, with legislative proposals and amended legislative proposals, and European Commission consultative documents in (since September 2011 in all official EU languages). Since 1 December 2009, also the Council has been feeding the database with legislative proposals and amended legislative proposals from the Member States, the Court of Justice, the European Central Bank, and the European Investment Bank. Each national parliament (each chamber of a national parliament) is a host of its respective part of the IPEX database. It feeds the database with its own information, documents or links related to the scrutiny of an EU document, including reasoned opinions regarding the non-compliance of draft legislative acts with the principle of subsidiarity. At the same time a parliament or chamber indicates what stage has this scrutiny procedure reached, by assigning an appropriate symbol (por. Symbol explanation in Status for parliamentary scrutiny column). The navigation of the website is possible in all official EU languages, parliamentary documents are presented in national languages and reasoned opinions translated into English or French. Proposals subject to subsidiarity checks are listed on the IPEX home page together with information on the 8-week deadline. On the website you can also find updated calendar of interparliamentary meetings in the European Union. See also: Documents of the Sejm in the IPEX, European Commission and European Parliament databases, OIDE Information No. 01/2014, p. 21.